A miter saw is already one of the most useful power tools that can easily find a place in any well-equipped workshop. There is, however, one fast and straightforward way to upgrade this too—using a stand which can seriously improve your cutting accuracy and lead to even better finishes to your cuts; this is why it’s so important that you find the best miter saw stand for you. As with any product sold these days, there are multiple models on the market from a wide range of manufacturers. This can make finding the right miter saw stand seem like something of a challenge. Hence, we’ve produced this guide detailing three of the best stands right now to help you make the right decision. The first product we’ll look at is this bench from Craftsman, which includes a number of useful features and design points. Chief among them has to be its compatibility with most types of saws, which is always nice to see as no one likes to pick up a tool upgrade only to find it doesn’t fit the original tool. This stainless steel product is nice and light; in fact, the lightest on the list, specifically almost 25 pounds. Such weight and combined with its excellent, solid rubber wheels, this is an item that provides very good mobility. Although having a low weight can be advantageous, some problems might occur. With that kind of weight, this bench can become a little shaky and unstable under pressure. Nonetheless, this product can extend out up to 80 inches, which is extremely generous and should be fine for most jobs. It also has rollers that are made of galvanized steel to give the product the right amount of support, as well as for easier movement. This is a very solidly built product from DeWalt. The first thing that catches your eye is the tubular steel construction that makes it look more like a hospital gurney than a traditional saw stand. This 67-pound stand is equipped with a pneumatic-assisted raising and lowering system so that setting it up will not be a hassle even if you are a first-timer. The mounting rails can be adjusted to give it a nearly universal fit for the vast majority of miter saws on the market. 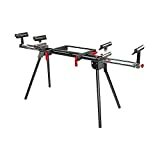 This miter saw stand has an extended height and width of 32.5 inches and 98 inches, respectively. It can provide up to eight feet of support and can carry a tool as heavy as 300 pounds. With these features, you have a stand that is designed to take on a variety of cutting projects. Ironically, the main issue with this stand is the exact opposite of the issue we found with the ToughBuilt Stand we discussed above. Unlike the Craftsman, this stand is extremely heavy, which again has pluses and minuses. On the plus side, this stand provides the right amount of stability during operation. The negative is that it is much harder to move around. So, if your stand will be in one place at all times, that extra stability is a real selling point, but if you need to transport it from site to site, you’ll soon get sick of hauling it in and out of a truck bed. 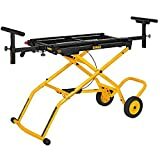 The good thing though is that DeWalt made sure that you can move this product around without too many hassles by integrating this stand with wide wheels that have rubber lining. Our final product is from POWERTEC, and it really does bring quite a lot of features. In fact, certainly enough to live up to that “deluxe” tag. Setting up this stand is a dream. Its legs are loaded with springs that are securely locked in place to provide a high level of stability. Its maximum weight capacity is at 330 pounds, which is very impressive especially given the fact the stand itself weighs less than 40 pounds. Additionally, its chunky rubber wheels make it easy to move around, while the steel rollers provide the right amount of support. The only real drawbacks with this model relate to its length and to the built-in power outlet. With regards to the power outlet, there is no switch included, which would be a nice added safety and convenience feature. This means that you won’t be able to cut the power right there at the table. Also, the arm extensions have a maximum width of 79 inches and length of 32 inches, which is a bit shorter than the other two stands we’ve looked at today. That will limit the length and width of surfaces that you can cut. However, it could be useful if you have a limited space to work in. We’re feeling a little Goldilocks here as we come to our verdict, so bear with us! We feel that the Craftsman, while highly mobile is a little too lightweight to provide the high degree of stability miter saw stands need to provide. The DeWalt has the opposite problem, being very stable but also very heavy. The POWERTEC MT4000 though seems just right. 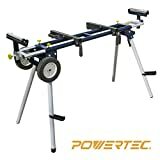 It manages to mix the mobility and ease of use of the ToughBuilt along with the high weight capacity and stability of the DEWALT to clearly stand out as the best miter saw stand you can buy. Battery Lawn Mowers – The Best Option for Your Lawn?